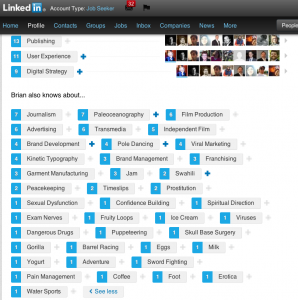 If you have a presence on LinkedIn, chances are you’ve been “endorsed” by peers for various skills. These may, or may not be the skills with which you want to represent yourself. But LinkedIn doesn’t ask you, or, apparently, care. Your connection sees your photo, with a list of suggested skills that he or she can click on to “endorse” you. LinkedIn says more than 500 million of these endorsements have been made since the feature was introduced. But really, so what?! No thought is required. No actual knowledge of what you do is needed. A lot of people, including me, think these new “endorsements” are meaningless. And now they’ve led to a practice called Endorsement Bombing, which is meant to point out the silliness of the feature. Frankly, LinkedIn has missed the mark, and it’s kinda fun to have a laugh at them. I imagine LinkedIn won’t be particularly amused. But maybe they’ll abandon this absurdly shallow practice as a result. I’m willing to bet that Endorsement Bombing will soon go viral. Are you game? It takes some stones to be confident enough to be endorsed for some of the things that Brian’s endorsed for. I hope this gets a rise out of LinkedIn!